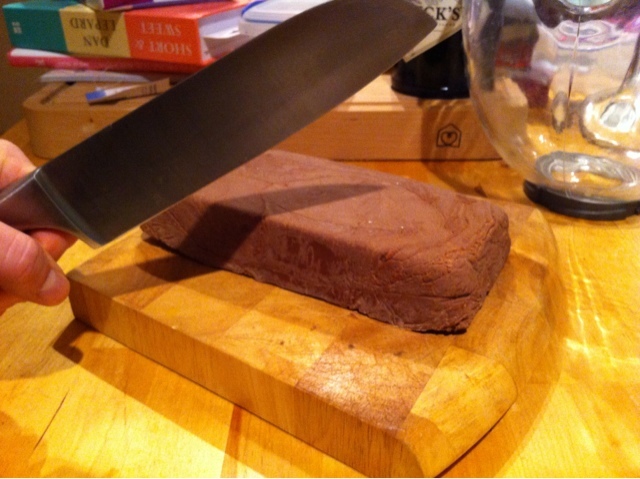 Not possible I hear you cry! Well, I think I may have put a bit too much chocolate into my fudge as it is not really structurally strong enough to cut into lumps, it tends to fall apart! 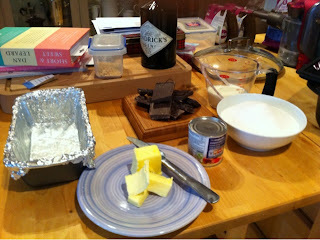 Perhaps then it is not a case of too much chocolate but of not enough everything else... It does taste great tho, so its not really a problem! 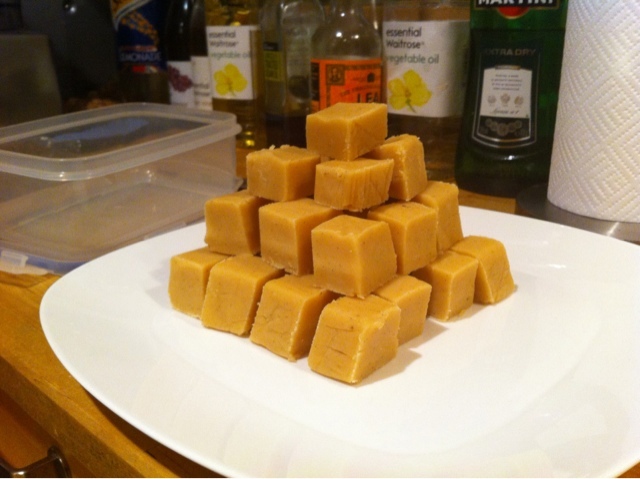 I based it on the same recipe that I used last time for the vanilla fudge, only I left out the vanilla pod and replaced it with 200g of Bournville. 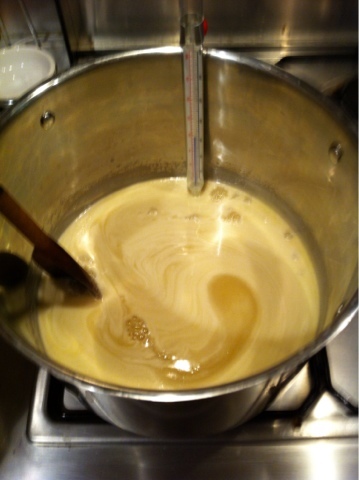 The method is also the same, but you stir in the chocolate at the end instead of the vanilla. 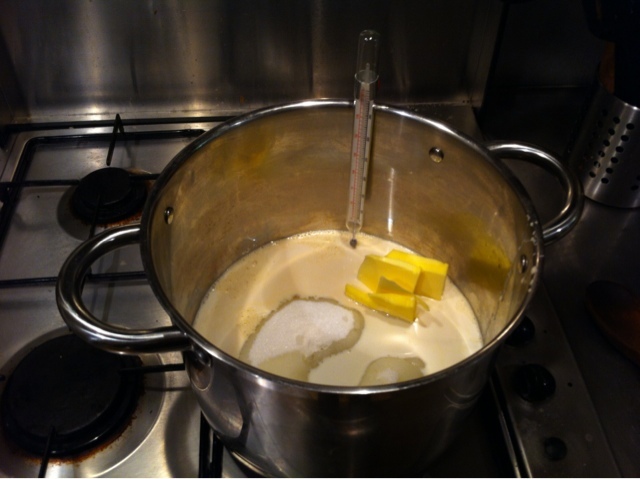 I was using my new sugar thermometer which has the various points you have to heat the sugar to already marked on it which makes it a lot easier to use. I chopped the chocolate up really small so that it would melt in easily to the hot sugar mixture, however I think that because I used a lot of chocolate (always a good thing) it lowered the temperature of the sugar mix a bit too quickly so it started to solidify really quickly and the chocolate didn't get totally incorporated which is why the finished fudge has a slightly swirly appearance and possibly why it crumbles quite so much... Next time I am going to try melting the chocolate before I stir it in so that the temp of the chocolate is similar to that of the sugar so it doesn't go solid quite so quickly and I don't have a mad panic trying to get it into the tin before it welds itself onto the bottom of the pan! My next experiment will also involve adding some instant espresso powder in make the flavour more chocolaty. 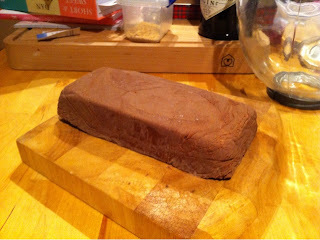 In lots of my recipe books espresso powder is often added to chocolate cakes or puddings, as the coffee flavour helps to enhance the chocolate and make it less sweet and more intense. 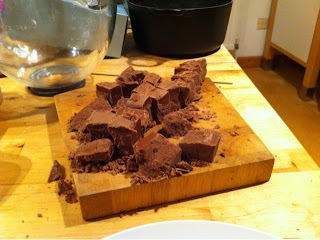 Another good reason to keep experimentng with fudge. Cool and ready to remove from the tin. All in the pan and ready to go. Dissolving the sugar and butter into the evaporated milk and full cream milk. 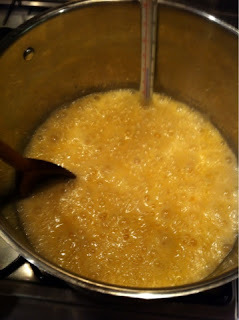 Starting to bubble and boil. Boiling away nicely and expanding in volume. 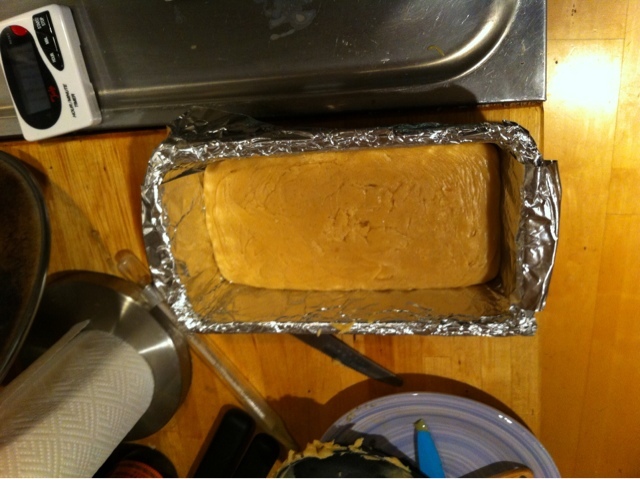 All boiled and stirred and ready to put in a tin. I lined the loaf tin with foil to make sure the fudge did not stick whilst cooling. 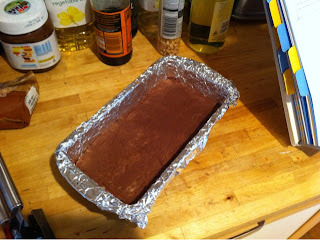 After cooling the fudge is ready to turn out. 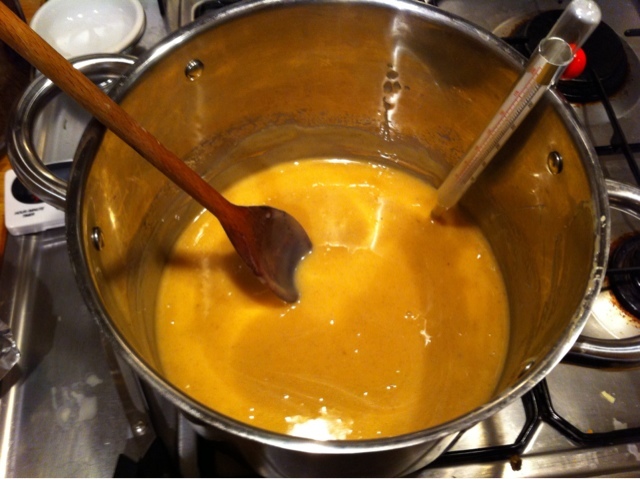 Whilst making the fudge I found it amazing how much the sugar boils up as it gets to boiling point and beyond, so you do need a big pan or you'll end up with sugar all over the stove top... 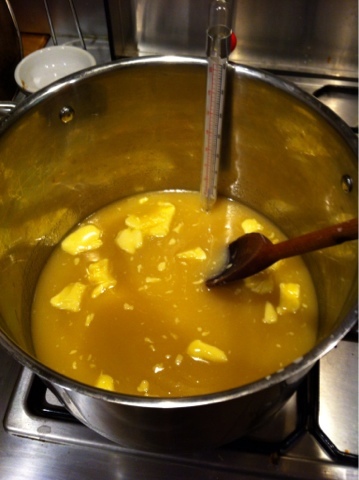 I used our stock pot and was very glad it was so big. It helps to have everything ready to just shove in as if you stop stirring for long the sugar catches really quickly and will burn before you rescue it. 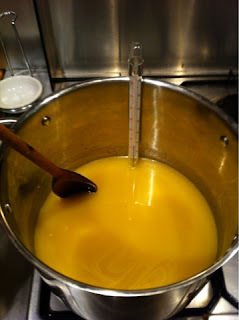 Having a sugar thermometer is also essential as until I have lots more experience in fudge making I cannot judge by sight when the fudge has reached the right temperature. 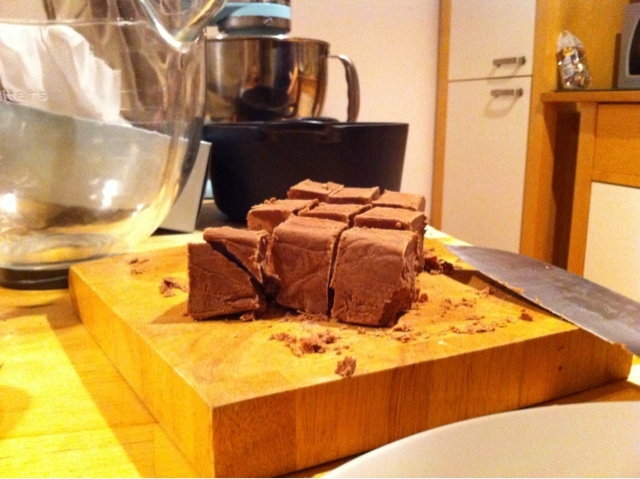 You can drop a little bit of fudge into a glass of water and they should sink to the bottom and form lumps. Then if you dip your fingers into the water and squish the fudge it should be a 'definite ball of toffee', sounds fine in practice but I didn't have a clue so stuck with the sugar thermometer! Also resist the temptation to stick you finger on the sugar mixture... 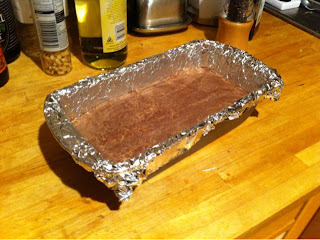 It's blooming hot and you will burn yourself badly... Another fudge tip is that when you are finished don;t try and scrub the inevitable sugar deposits off the bottom and sides of the pan, but fill the pan with boiling water and replace it on the heat and give it a good boil. 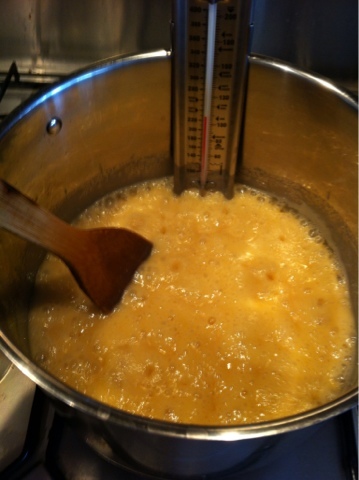 This will dissolve all the sugar into the water and once you pour the water away (carefully!) 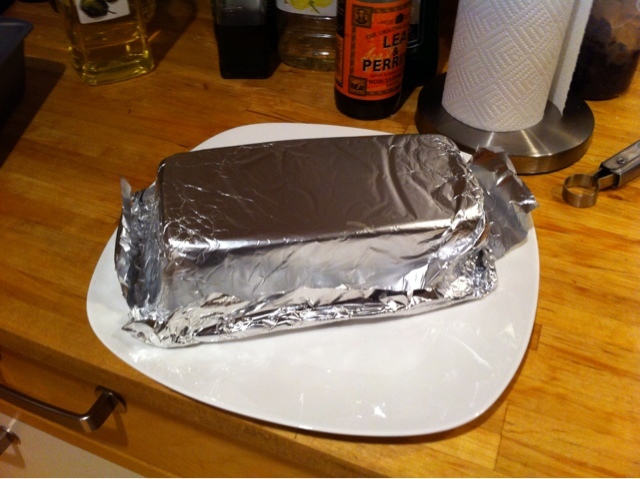 you can wipe anything left off really easily! 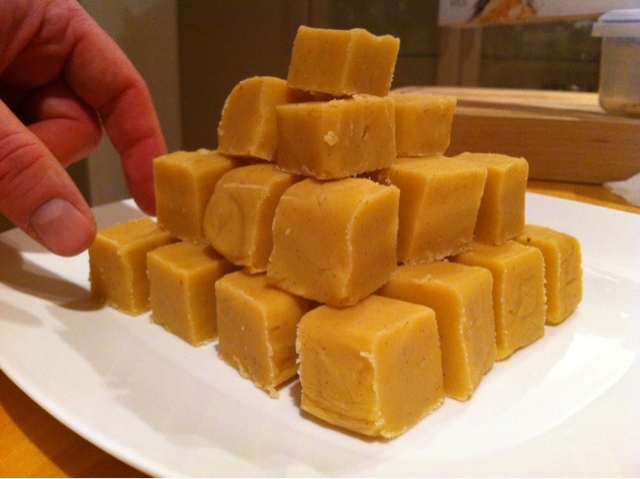 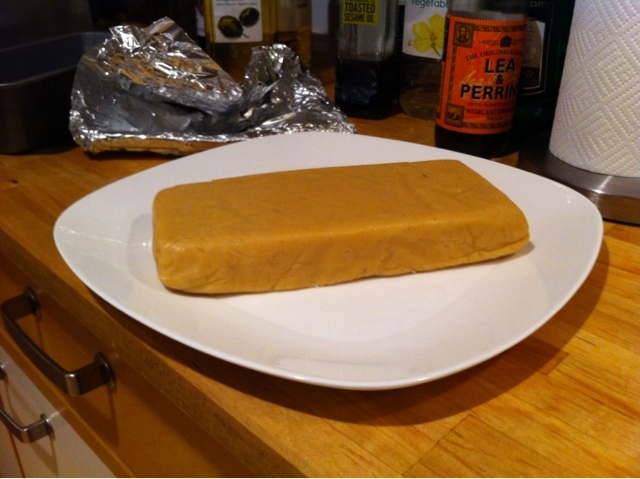 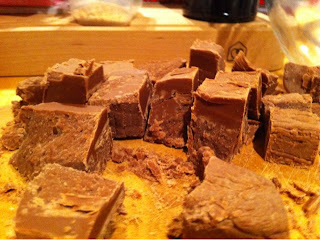 Much better than elbow grease and hard work :-) I was really pleased by how my fudge turned out. 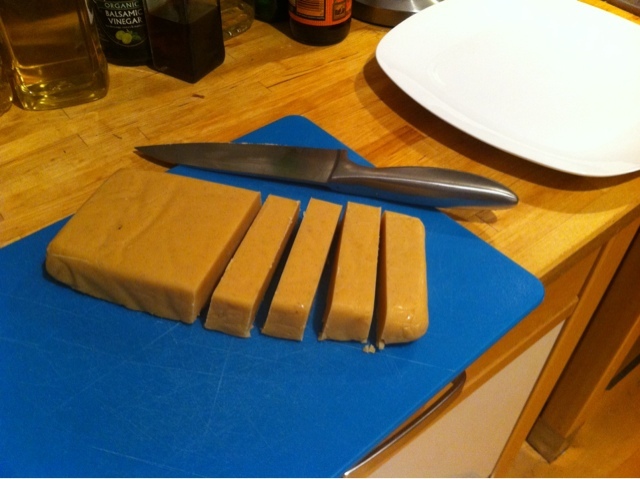 It was really vanillary and smooth and soft with no lumps or grainyness. It also got eaten very quickly, so I shall be trying more of this and more flavours soon. 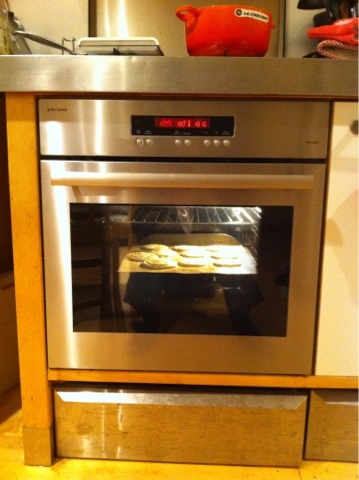 A normal oven - at last! 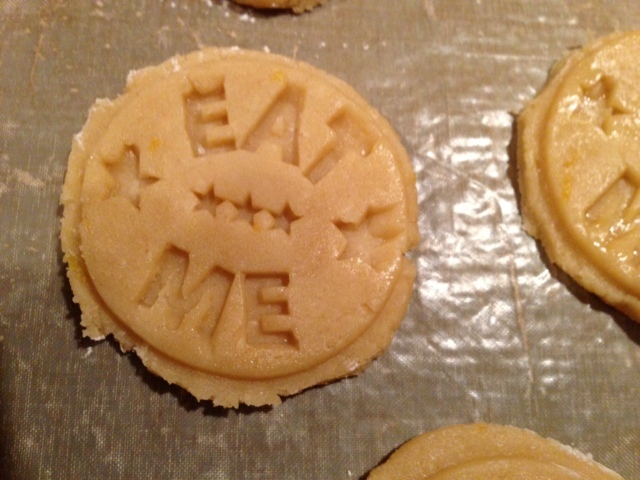 Edges are a bit rough, but the message is clear! Batch 1, fresh from the oven. 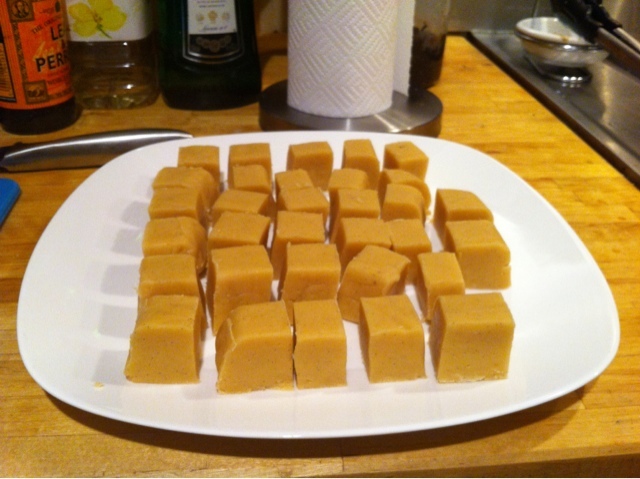 The first batch did spread a bit, as you can see from the picture above. I know I got the tray the wrong way up to read the message before anyone points it out! However, as you can see from the close up below it is fairly legible. With the second batch I tried a slightly different technique. 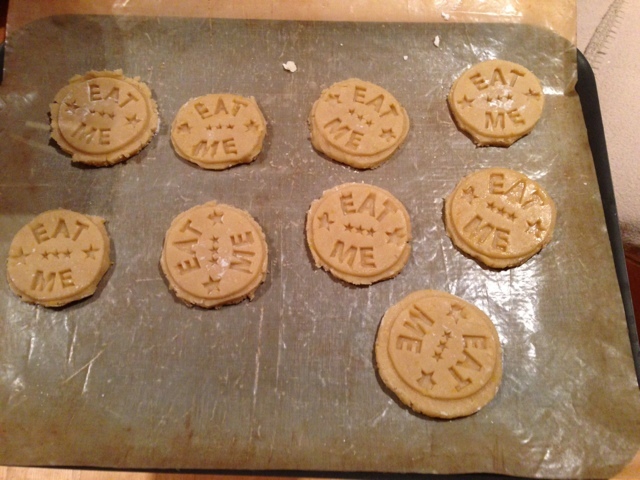 I rolled the dough out and then stamped several biscuits and cut round them with a knife. 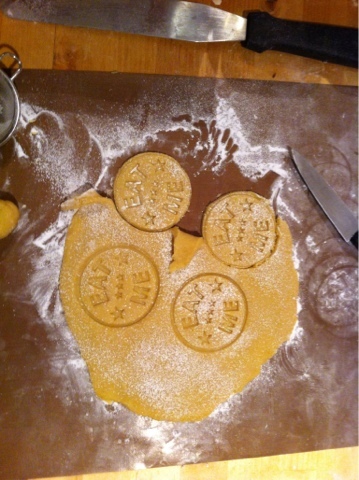 It would have been even easier with a round cookie cutter but non of mine were the right size. 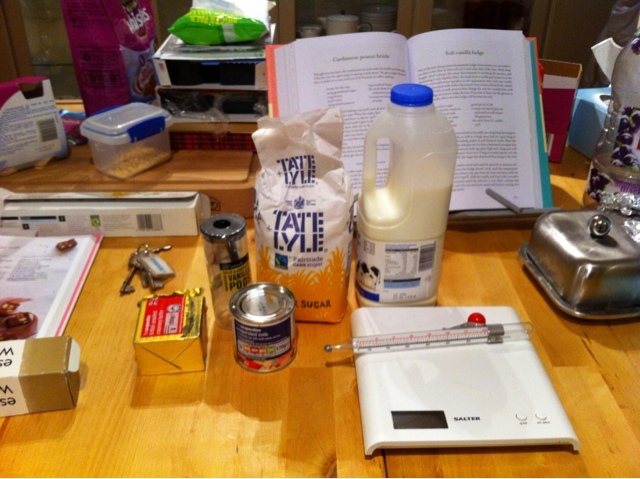 I did the last two as stamped golf balls as the dough had warmed so much by then that it would not stop sticking onto the rolling pin... 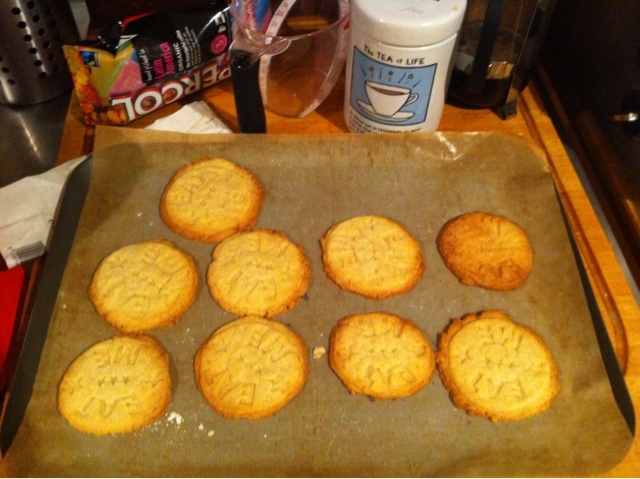 I also re chilled the stamped biscuits on the baking sheet for 10 minutes or so to firm the dough up before I baked it so it didn't spread as much as the first batch which I think did actually help. I do think the second batch look a bit neater with clearer lettering. 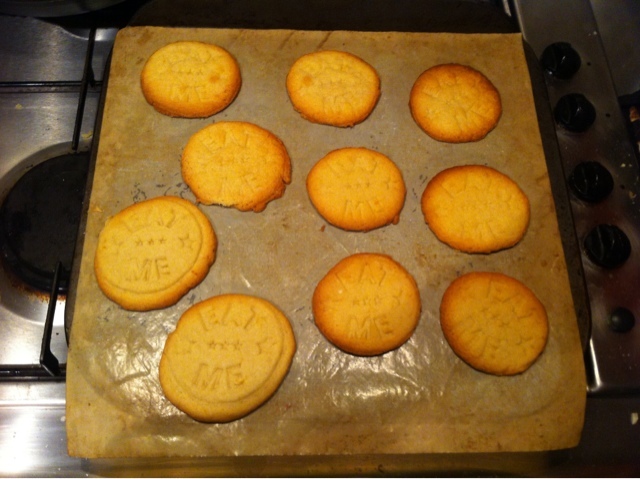 They are really rather good biscuits, especially dunked in tea, being very nicely flavoured of lemon and vanilla. 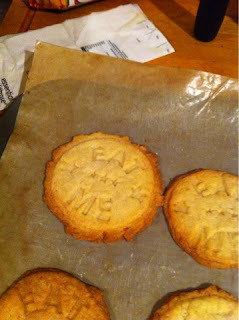 I think I'll probably put in more lemon next time as it was as but too subtle for me. 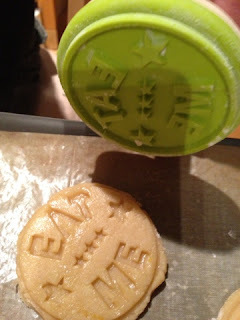 The next recipe I'm going to try with the stamp is shortbread as that is traditionally stamped or patterned with a mould so may take the lettering even better than these. It's all just an excuse to make more biscuits!